Every day in the Harbor of Tory Island, Ireland, you can find a dog and a dolphin playing with each other - they use to swim together! 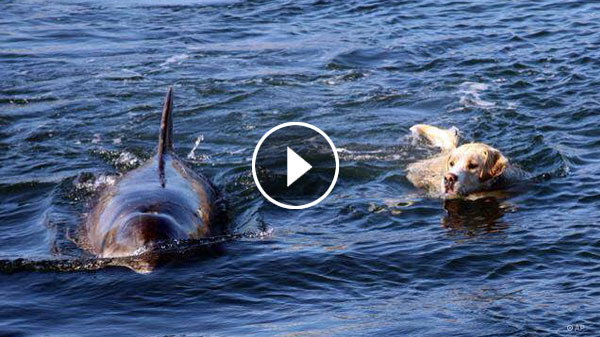 These two animal from different species bond like no other and they simply defy expectations. It is definitely the sweetest thing ever happened in the animal kingdom. Locals named the dolphin as Duggie, He became a regular fixture for several years, following the ferry boats in and out of the small bay. Apart from his interest in boats, Duggie befriended a golden Labrador Retriever named Ben. The dog took a shine to Duggie too, going down to the pier almost daily and looking for his friend. As soon as he would spot Duggie he will jumped into the water for a friendly swim.